Hellooo – crikey I know it’s been a while but I’m baaaaack! (I haven’t literally been away, but y’know). 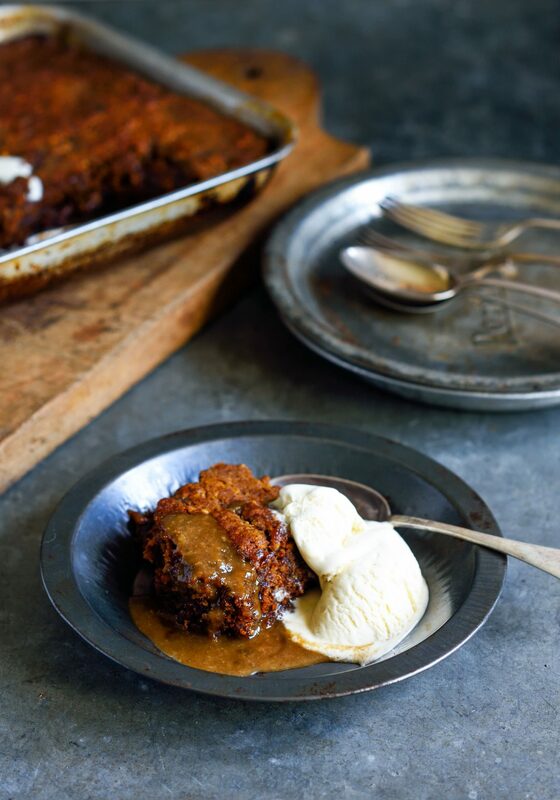 So today’s recipe is just in time for a weekend when the evening air has a bit of a nip, and we can start to justify some good, calorie-laden sweet and sticky pud – in this case ginger, date self-saucing pudding studded with nubbly walnuts – the addition of the spicy ginger and texture from the nuts is such a bloody pleasing combination. Serve with vanilla bean ice cream (and for my Dad, pouring cream) and enjoy. (This is a recipe I first put together and shot for the good people at Dish magazine last year – a total classic). 300g dates, halved 1 teaspoon baking soda 100grams softened butter 1 tablespoon for greasing the dish ¾ cup brown sugar 2 eggs 1 ¼ cups self raising flour 2 tablespoons ground ginger 1 cup walnut halves topping: 2 tablespoons butter ¾ cup brown sugar 1 tablespoon ground ginger 1 tablespoon freshly grated ginger ½ cup cream Grease a 25cm x 28cm baking dish and preheat the oven to 180˚C. Put the dates in a non-reactive bowl, sprinkle over baking soda and pour over ¾ cup boiling water. Stir to dissolve then leave to sit for half an hour. Put the dates and soaking water in a food processor and whiz to form a thick date paste then tip out into a bowl and set aside. Put the butter and brown sugar in the food processor and whiz until pale and fluffy, add eggs one at a time and pulse to combine. Add the flour and ginger and pulse briefly then add the date paste and nuts and pulse again until all incorporated. Pour out into the prepared tin, and flatten out the surface with the back of a tablespoon. Put the butter, brown sugar, ginger and grated ginger in a jug. Add 1 3/4 cups boiling water and whisk to combine. Add cream and whisk again. Pour over the back of a tablespoon all over the pudding and bake for 40 minutes. Sit for 5 minutes before serving with vanilla ice cream. Love your blog! While in Florence go to the San Marco Museum – an old Dominican monastery that doesn’t feature high on things to do but is well worth the visit. Also make sure you visit Mercato Centrale market – you will die and go to heaven! Does the entire date/hot water mixture go in the food processor, or just the dates? Thank you!